As I’ve mentioned in other posts, I love guessing games. I often ask people to guess things, and I enjoy when people ask me to guess, too. I’m guessing I love guessing games because that was a tradition in my family. When I was growing up, my father, mother, sister, and I would try to guess something somebody was thinking about, by asking Yes or No Questions. For example, my father might say, “Guess who I saw today?” and the game was afoot. I think it’s fun to guess. Although — as I’ve written about before (guess how many times!) — guessing things, without balancing that with reality testing, can sometimes lead to confusion, errors, and pain. Something I’m not sure of: Should there be a question mark at the end of a “Guess” invitation, like the one about our fellow blogger above? Is that a question or a statement? I have to end this blog post early today. Would anybody like to guess why? This is too much fun! I don’t want this post to end. Ann: I’ve got to go blog. Michael: What’s today’s topic, baby? Ann: No. That’s the topic. Michael: I can’t. What is it? Guess what that reminds me of? Thanks to my family, to Michael, to guessers everywhere, and to you — of course! — for reading (and, I hope, guessing) today. I can’t take a sensible guess except to add that the print ink in cartridge comes out to $2,500 a gallon ! Thank you for this sensible comment, Carl. Now I can ask people, “Guess how much print ink in a cartridge costs per gallon”! $4,796.80 per pound… could it be caviar? Or a mistake? Thanks for being brave enough to guess first, Annabelle. Not caviar and not a mistake. What is the connection between Vincent Van Gogh and Frozen? Truffles? Hmmm. I can’t even guess, right now, about that connection. But are you guessing Truffles for the expensive item? Great guess, but not exactly. 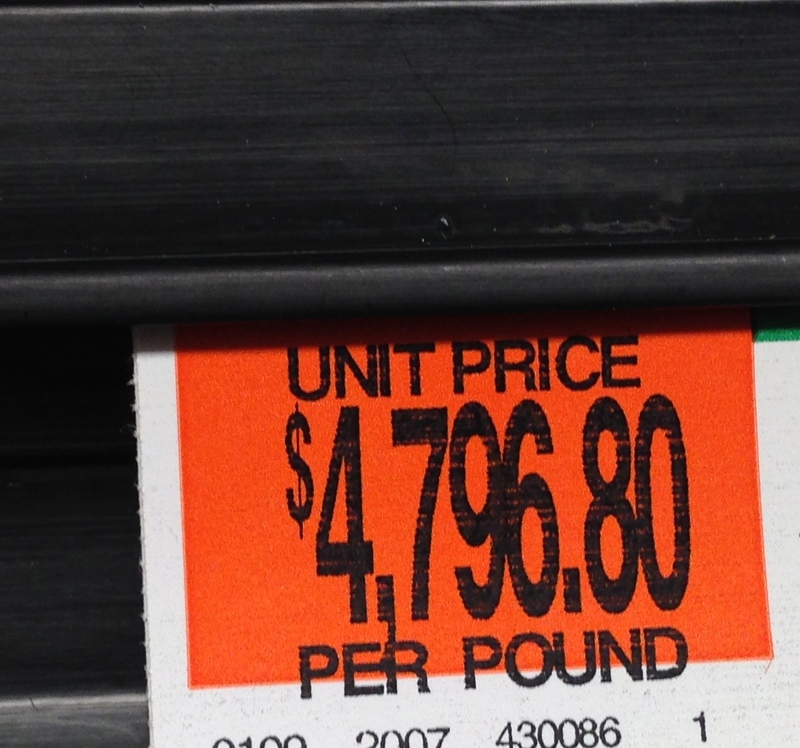 I love guessing games too — but seriously — $4,796.50 per lb? in a grocery store? I’d have gone with truffles too so now have to guess…. some type of rare mushroom? Great guess, Louise! And you are very warm! Hey, Abbott! With Easter season afoot, I guess that it’s gourmet jelly beans. Who’s on first, Ann? It’s opening day! I don’t know’s on third, Mark, but it’s not Jelly Beans. Didn’t he used to play for the Yankees? Naw, he used to date Madonna. Oh, well. It’s the thought that counts. Thanks, Kenneth! All I can guess is truffles or saffron; those, or perhaps that cinchona bark that replaces all 70 billion cells in your body within 3-4 hours (hold onto something tightly). Incidentally, we played guessing games growing up, too, but they involved things like my father trying to guess my name. Thanks for this excellent comment, Rob, and very good guesses. Pardon me while I look for some cinchona bark during my lunch break. It might be, Mel. I saw this in a local, ordinary, totally non-fancy supermarket. No, it’s not some sort of gold flake, although I would love to see gold flakes in the supermarket. Thanks for the great comment! Guess what I think about this comment!